Forum participants including mayors, CEOs, artists, and policy experts participated in small deep-dive workshops at the 2018 Chicago Forum on Global Cities. The workshop discussions and outcomes will be summarized in a series of publications that will provide a basis for strengthening solutions in cities worldwide. Publications will be rolled out through the fall of 2018. Check back for updated reports. The future of thriving, sustainable cities is anchored in building codes and standards, according to a new Council report, made possible with support from the USG Corporation and Robert R. McCormick Foundation. Fifty percent of urban carbon emissions come from heating, cooling, and operating buildings. 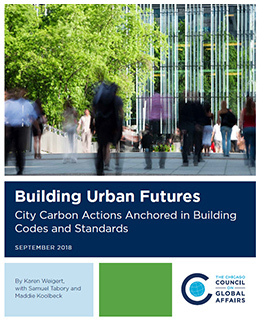 Codes and standards can lead the way to net zero buildings and thriving low-carbon cities. Read the report.